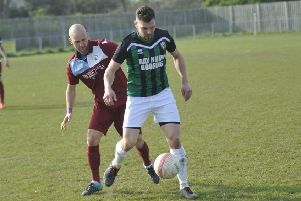 The race for the East Sussex Football League Premier Division title took a dramatic twist on Saturday. Sidley United were the big winners even though they didn’t play because the other two teams vying for top spot both suffered 2-0 defeats. Bexhill Town lost at home to fifth-placed Robertsbridge United, who they had beaten 3-0 in the previous weekend’s reverse fixture. Second half strikes by Curtis Coombes and Chris Phillips won it for the Bridge. And Battle Baptists were beaten by the same score away to fourth-placed Sedlescombe Rangers. A Ryan Edwards double sunk the National Christian Cup finalists. Bexhill remain top on goal difference from Sidley and three points clear of third-placed Battle, but the leaders have now finished their programme, whereas Sidley and Battle each have a game left. A point for Sidley at home to Robertsbridge on Easter Saturday will secure the title. Elsewhere in the top flight, seventh-placed Hawkhurst United and sixth-placed Rye Town ended their seasons by drawing 0-0 with each other. In Division One, second-placed Wadhurst United received a walkover as hosts Bexhill United II were again unable to field a team. Hastings & District FA Junior Cup winners Wadhurst need to win their remaining three league matches to overhaul leaders Punnetts Town. Battle Baptists II and Rock-a-Nore played out a 2-2 draw in a key game in the race for the Division Two title. Adam How and Daniel Mayo scored for Battle. Battle, who are currently second, will finish behind leaders St Leonards Social II by one goal on goal difference, while Rock-a-Nore, currently third, need four points from their remaining two fixtures to overtake both and be crowned champions. Catsfield moved up a place to fifth on the back of a 5-0 success away to Robertsbridge United II. Adam Barham (2), Brandon Kovacs, Peter Rollinson and William Thwaites got the goals. Northiam 75 II ended their Division Four campaign in style with a 9-1 victory at home to Parkfield. Adam Page, Max Warden and Paul Rockett all netted twice, while Hayden Reed, Fin Thompson and Joe Millar were also on target for third-placed Northiam. Matt Holland bagged Parkfield’s consolation. Sixth-placed West Hill United drew 2-2 at home to fourth-placed Sovereign Saints II. The goals of Conor Loake and Tyler Smith for West Hill were matched by Mohamed Moussa and Dom Sharp for Saints. There were also five fixtures in the ESFL Supplementary Cup Competition. Hooe won 4-3 at home to Burwash in group A via the finishing of Jamie Beard (2), Callum Holt Burgess and Aiden Pierce. Liam Baker (2) and Blake Marchant replied for Burwash. Division Five runners-up AFC Hollington pulled off a splendid 4-1 win away to mid-table Division One side Crowhurst in group B. Tom Winch notched for the Crows. In the same group, Sandhurst triumphed 3-2 away to Cranbrook Town courtesy of strikes by Nathan Moseley, Andrew Turner and Oliver Bryan-Kerr. Sedlescombe Rangers III received a walkover in group C after scheduled visitors Ticehurst were unable to raise a side. David Ammoun and Connor Jackson hit the net as Division Five champions Little Common III prevailed 2-0 away to Division Three outfit Orington in group D.
Two cup finals will take place at The Pilot Field, home of Hastings United FC, next week. Sovereign Saints II will take on Welcroft Park Rangers in the ESFL Cooper’s Construction Challenge Cup decider on Monday before Little Common III and AFC Hollington will lock horns in the Hastings & District FA Lower Divisions Cup final on Tuesday. Both matches will kick-off at 7.30pm.